Have you ever found an especially fabulous blog post, and bookmarked it? Yes, of course you have. But have you then found that a few weeks later you can’t remember exactly which bit of the post had seemed so interesting, or even why you’d saved it in the first place? This happens to me. A lot. So it was with deep joy that I came across (via this Mashable blog post) a new free tool called Highlighter (still in beta). It does what it says on the tin – it highlights. You can highlight bits in a blog post. No need to worry any more about middle-aged forgetfulness, because not only can you highlight snippets of interest, but you can leave comments for the blog author on your highlighted snippets. And you can share the highlighted snippets with your own network via email, Facebook and Twitter. And Highlighter is free. But wait – one snag. 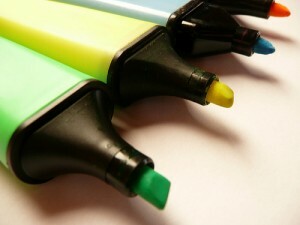 The blog author needs to have Highlighter installed on his or her blog. And Mashable didn’t. So I’m writing this blog post for two reasons: partly so I don’t forget about why I bookmarked the Mashable post in the first place, but mostly to try Highlighter out with you, dear readers. But not just on this blog. On your blogs too. First, you need to sign up for a Highlighter account yourself, to be able to comment on and share highlights. This blog has 11 posts about mLearning (mobile or handheld learning) – listed below. Look at any that take your fancy, and highlight at least one snippet you find interesting / useful / relevant / or that you simply want to remember. Drag your mouse over the snippet to highlight it, and you will see some options. Leave a comment on your chosen snippet if you like, and /or share it with others (remember you need a Highlighter account for this). You should be able to see and read other readers’ highlighted snippets and comments as well. I would love to be able to highlight, comment on, and share snippets on your blog too. If you have a blog, install the free Highlighter plug-in, and then leave your blog URL in the comments below this blog post. I (and any other readers) can then go along to your blog, browse your posts, and do some highlighting! The Highlighter plug-in is compatible with WordPress, Blogger, Tumblr and Typepad. It took me about 2 mins to install it in this WordPress blog.